I'm the author of the New York Times bestsellers "The Happiness Project," "Happier at Home" and "Better Than Before." I write about my experiences as I test-drive the wisdom of the ages, current scientific studies, and lessons from popular culture about happiness, habits, and human nature. My next book will hit the shelves in summer 2017: "The Four Tendencies: The Surprising Truth about the Four Hidden Personality Types That Drive Everything We Do." Find out your Tendency-are you an Upholder, Questioner, Obliger, or Rebel?-when you take the free quiz at GretchenRubin.com. 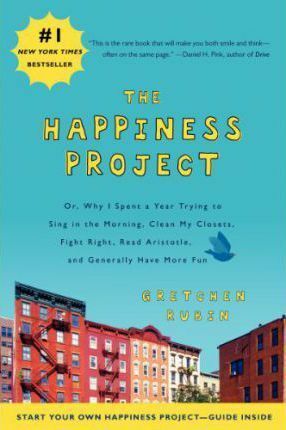 Subscribe to my award-winning weekly podcast "Happier with Gretchen Rubin" (more than 1 million downloads each month) and hear my sister and I discuss strategies and tips for how to make your daily life happier. I also created an app to help people harness the power of the Four Tendencies. Learn more at BetterApp.us or search the app store for "Better Gretchen Rubin." My previous books include a bestselling biography of Winston Churchill, "Forty Ways to Look at Winston Churchill," and one of John Kennedy, "Forty Ways to Look at JFK." My first book, "Power Money Fame S..: A User's Guide," is social criticism in the guise of a user's manual. I wrote "Profane Waste" in collaboration with artist Dana Hoey. I've also written three dreadful novels that are safely locked away in a drawer.